Members of the Co-operative in the UK are being recruited to take part in an egg hunt with a difference – looking for shark eggs on beaches. The Shark Trust’s “great egg case hunt” will see volunteers heading to the coast to search for the egg cases, known as “mermaid’s purses”, in which the young of many skates and rays and some sharks are laid. They will use an identification guide to discover which species hatched from the egg and record the location where it was found, as part of conservation efforts to ensure the UK’s shark species are adequately protected. Recent estimates suggest almost 100 million sharks are being killed worldwide by commercial fishing fleets, with sharks’ fins being used for a soup delicacy in Asia. Governments have recently agreed to boost protection for five species of shark under a global treaty governing trade in endangered species, so the trade in them is regulated to ensure it is sustainable. The Co-operative is working with its members; pupils in 5,000 schools signed up to the group’s “green schools revolution” sustainability education programme, and the Shark Trust to get people involved in the egg hunt. It is hosting seven events around the UK in the coming months, which will see an expert from the Shark Trust explaining to hunters what they need to know about egg cases, how to identify them and how to record their finds. Many species of skates and ray and some sharks reproduce by laying leathery egg cases, which remain on the seabed or attached to seaweed for several months while the embryo develops into a miniature version of the adult. 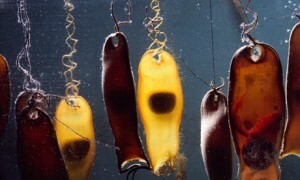 Once the young have hatched the egg cases can be picked up in currents and washed up along the shore. Cat Gordon, conservation officer at the Shark Trust, said: “The great egg case hunt was established in 2003 and more than 33,000 individual egg cases have since been recorded.” She said linking up with the Co-operative would help increase knowledge of the distribution of British egg-laying species of sharks, rays and skates. She added that anyone could take part in the project by visiting their local beach and reporting online any mermaid’s purses they see.